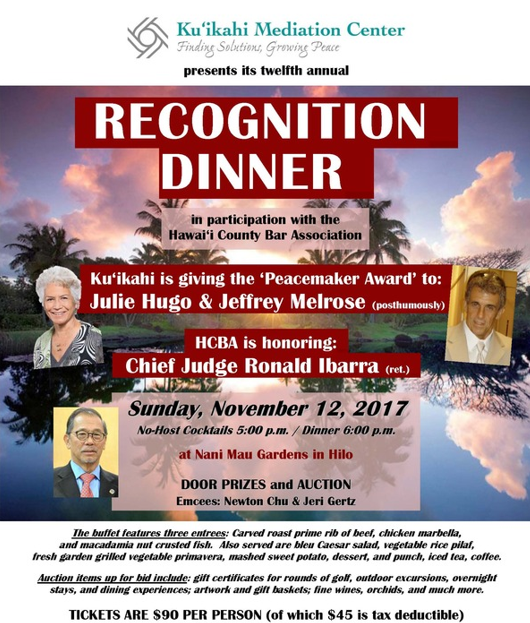 The Hawaiʻi County Bar Association (HCBA) will host its Twelfth Annual Recognition Dinner and Auction at the Nani Maui Gardens in Hilo on Sunday, Nov. 12, 2017, beginning at 5 p.m. 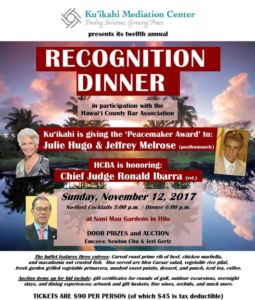 This year, Ku‘ikahi Mediation Center is giving the Peacemaker Award to Julie Hugo, vice president and broker-in-charge in East Hawaiʻi for Clark Realty Corporation. The award is also go to Jeffrey Melrose (posthumously), land-use planner and past president of KMC. The HCBA is honoring The Honorable Ronald Ibarra, retired chief judge of the Third Circuit. Newton Chu and Jeri Gertz will emcee the gala event, which will feature a cameo appearance by Harmony on Tap, guitar music by Unzan Pfennig and door prizes. Items up for bid in the silent and live auctions gift certificates for rounds of golf, outdoor excursions, overnight stays and dining experiences; artwork and gift baskets; fine wines, orchids and more. This fundraiser provides a significant portion of the funds that KMC needs to provide free and low-cost dispute prevention and resolution services in East Hawaiʻi. Tickets for the Annual Dinner are $90 per person (of which $45 is tax deductible) and are available from KMC’s board of directors; KMC’s office in The Hilo Lagoon Centre at 101 Aupuni St., Ste. PH 1014 B-2; Day-Lum Rentals; and The Most Irresistible Shop. Click here for a form to purchase tickets, reserve a table, sponsor the event, make a donation or contribute to the auction. You can also call Jenifer Aveiro at (808) 935-7844, ext. 1, or email jenifer@hawaiimediation.org.